Residents have been getting letters from Public Works encouraging them to buy water and sewer line protection from HomeServe. Part 1 of a two-part series. Above: The city wants residents to buy water and sewer line coverage from this Connecticut company. By now, if you live in Baltimore City, you’ve likely received in the mail an official-looking letter signed by Rudolph S. Chow with the city’s black-and-yellow municipal seal in the upper left hand corner. Chow, director of the Department of Public Works (DPW), invites you, the homeowner, to enroll in a service plan to protect your pocketbook from the cost of potential pipe repairs. Specifically, on the water and sewer pipes between the street and your house that you – and not the city – are responsible for repairing. A utility line break can cost property owners thousands of dollars. Not only does Chow urge you to get coverage, he recommends a particular company with whom the city has signed a two-year contract – HomeServe USA, a leading provider of home emergency service plans that serves 1.6 million active policies in the U.S. and Canada. The solicitation has set off a ripple of anxiety in households and online discussion forums across town, in part because one company has been endorsed by city government. “I, too, got the letter from the city with the recommendation, but am I the only one who thinks the city endorsing one company is a serious conflict – and reminiscent of Sheila Dixon and those illegal back scratching issues. . .?” a Patterson Park area writer posted to Facebook. Another writer said he would check to make sure his homeowners insurance doesn’t already cover it,” but was suspicious of the timing of the insurance push. Rudy Chow’s letter encourages city residents to get water and sewer line protection from HomeServe. 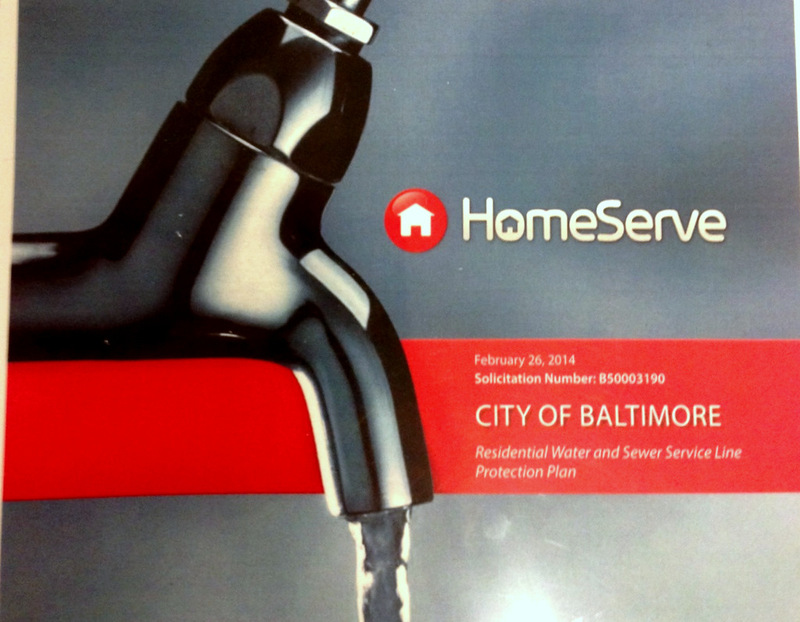 The marketing partnership allows HomeServe “exclusive rights” to establish and provide a residential water and sewer service line protection program for Baltimore residents. 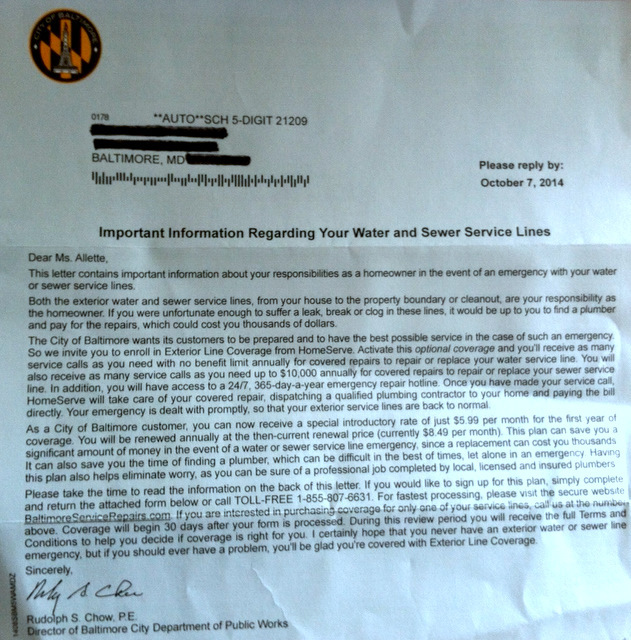 The letter from Chow says that for $5.99 a month for the first year (and a to-be-determined renewal price thereafter), Baltimore homeowners will get exterior water and sewer line coverage with no deductible. The sewer service line’s annual benefit limit is $10,000; the water service line has no annual benefit limit. Customers can also purchase either water or sewer line coverage separately. As part of its agreement approved last May by the Board of Estimates, the city would provide HomeServe a list of water and sewer customers for direct marketing purposes, and allow them to use city and DPW logos for “co-branding” products and services. Hence, the city seal on the solicitation from Chow. Why, though, is the city promoting pipe insurance? The insurance idea was first publicly revealed last November after the Board of Estimates approved an $83.5 million contract to start the process of installing “smart,” or wireless, water meters across the city. Timothy Krus, city purchasing agent, said the meter upgrades and related construction by the city could have an impact on aging pipes on private property. As a service to homeowners, he said, his office and DPW were preparing an RFP (Request For Proposals) to solicit private companies to offer warranty protection for residential water and sewer breaks. DPW now says that its partnership with HomeServe is separate and distinct from the city’s upcoming water meter replacement program. DPW spokesman Jeff Raymond also states that the city is not making money on this HomeServe contract. But an “administrative compensation fee” to the city was originally on the table – it was a requirement in the RFP to bid on the contract. Why the city first required an administrative compensation fee, but then chose not to accept it, is not clear. Chow’s solicitation letter to city residents is a little confusing as well. Additionally, it notes that HomeServe is headquartered in Norwalk, Conn., and that homeowners should make their checks payable to HomeServe USA – not to the City of Baltimore. 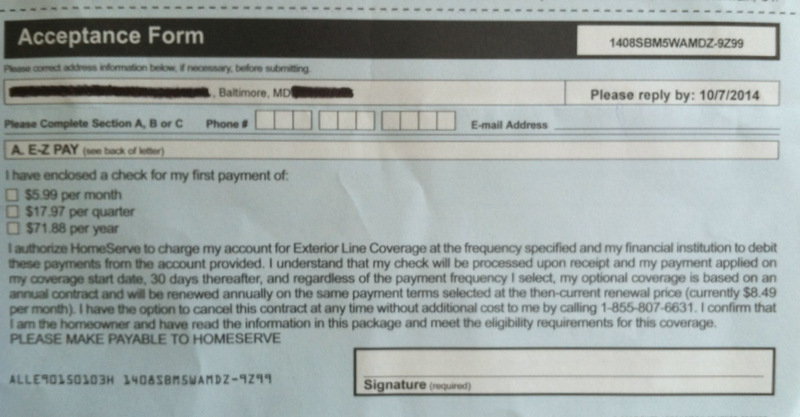 And yet, Chow writes: “if you are interested in purchasing coverage for only one of your service lines [instead of the bundle] call us at the above number.” The “above number” is HomeServe’s. Whatever the city’s rationale for the partnership, an insurance policy for old pipes in Baltimore City, at least in principle, might make sense for some Baltimoreans. But HomeServe’s policy is not insurance. It’s a warranty. The Chow letter includes an Acceptance Form for residents to fill out and return to HomeServe. The difference between an insurance company and a warranty company likely has little to do with the quality of repair service a subscriber receives (The Better Business Bureau of Connecticut gives HomeServe an A- rating), but it’s an important distinction in terms of oversight. Who would help consumers with problems with a warranty company? “We would refer any concerns to the Maryland Attorney General’s Consumer Protection Division,” Sviatko said. The Attorney General’s office has not reviewed HomeServe’s warranty. “The OAG doesn’t ordinarily review warranties unless there is a complaint or complaints and a reason to do so,” said AG spokesman David Paulson.